An exact replica (including the spiral staircase!) 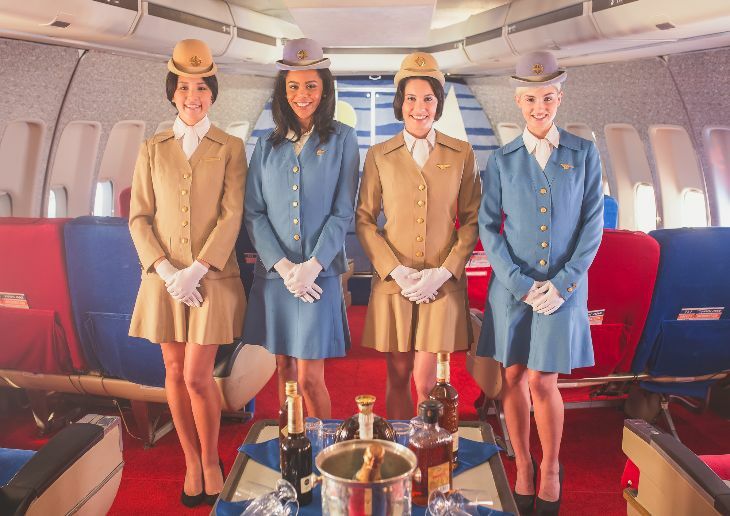 of a Pan Am Boeing 747 in Los Angeles is the setting for the new “Pan Am Experience” a four-hour affair that includes a four-course meal served from trolleys by “stewardesses” in vintage uniforms. But it’s not cheap. A step back in time to the so-called golden age of travel costs $297 in first class, $197 in Clipper class. Reservations are required and “passengers” have to dress up! “Guests are expected to dress the part, and and dress nicely, just like passengers did in the 1970s. We won’t require a coat and tie, but we will discourage jeans, sneakers, shorts or sandals. 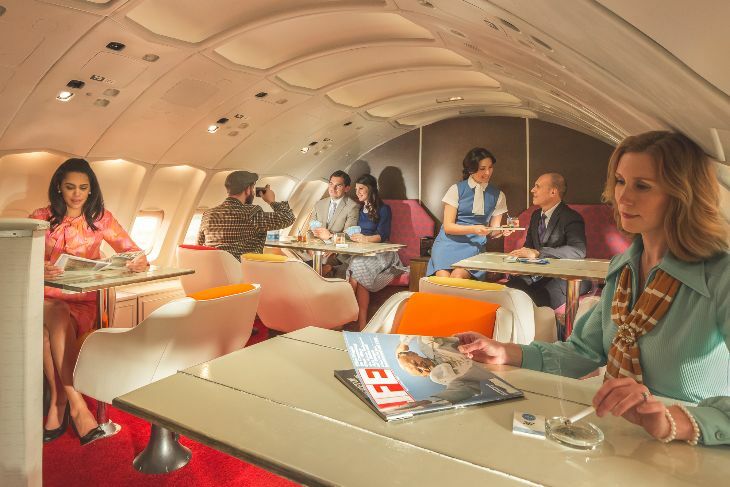 Our goal is to make this feel like Mad Men, and our guests should play the part,” said Rob Shalhoub of Air Hollywood, the company that has created The Pan Am Experience. 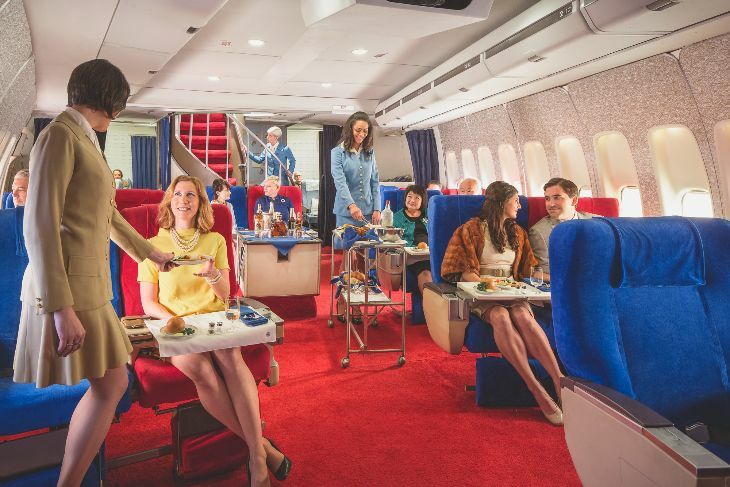 Inside the soundstage at Air Hollywood, a Hollywood studio specializing in aviation themed content, is an exact interior replica of a Pan Am 747, including both First and Clipper class cabins– plus the famous Pan Am upper deck lounge. There are all the furnishings also all the cabin decor that made the iconic plane so special, including the spiral staircase connecting first class to the upper deck, sleeperette seats, magazine racks (remember those?) and authentic Pan Am china, linens and stemware. In first class, stewardesses will start with cocktails, and then serve a four-course meal from trolleys on vintage Pan Am china. Shalhoub told TravelSkills that meal courses (provided by an airline catering company at LAX) will include a shrimp and lump crabmeat cocktail starter, chateaubriand carved seat-side, chicken and a vegetarian pasta. After dinner, a dessert, fruit and cheese trolley will roll through with liqueurs and coffee. Back in Clipper class, passengers will get the same meal served on a tray. In both classes, vintage 70’s movies play from the overhead projection system. 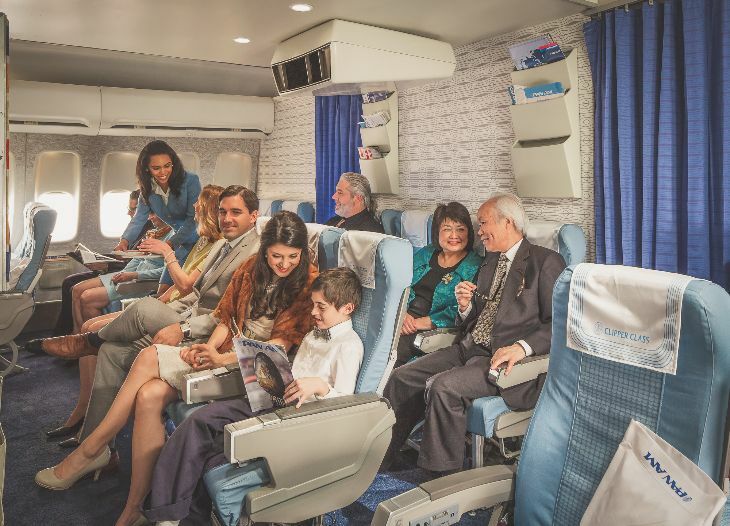 After the flight, participants will be able peruse the vast collection of airline memorabilia, shop for licensed Pan Am merchandize and explore Air Hollywood’s other movie sets and props used in hundreds of movies (like Bridesmaids or Airplane!) TV shows and commercials for the last 40 years. To create the experience, Air Hollywood teamed up with Anthony Toth, the owner of what’s likely the largest collection of Pan Am memorabilia in the world. Toth painstakingly recreated a Pan Am 747 in his garage to store his horde and entertain friends, and it grew and attracted so much attention that he had to move it to a warehouse. Eventually, Toth and Air Hollywood found each other and negotiated a deal to move Toth’s replica to the Air Hollywood soundstage in the San Fernando Valley. New: Limited time credit card bonus: 70,000 points to sign up! Shalhoub told TravelSkills that the first three events (Oct, Nov & Dec) are nearly sold out in First Class, but there are still plenty of tickets available in Clipper class. For more information, see The Pan Am Experience. What do you think? Would you go?